The soil has to be dug over, and broken down in to small crumbs. 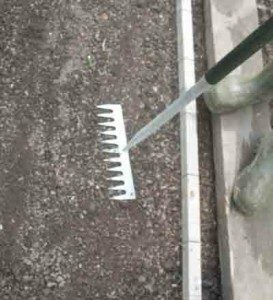 Then a rake will help to get an even depth of fine soil. 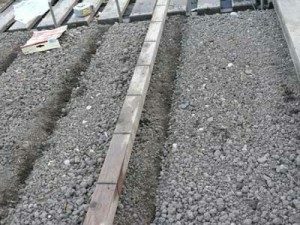 The stones can be removed by picking them up and carting them off in a barrow or bucket. Once prepared, cover the soil with a plastic sheet to keep it dry, until you are ready to plant up. Protect the soil from being trampled down by using a board to spread your weight. Mark out the soil or compost (before opening the seed packet!) to show where the rows will be. This means making a mark in the soil where you want the seeds to grow. 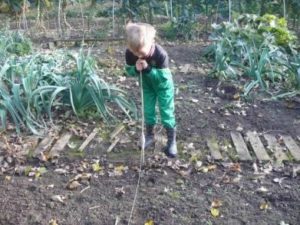 It is easier to look after plants if they are grown in straight lines, but they can be planted in any pattern you like. Or, instead of using a solid edge, use string between two sticks. Stretch the string so it is tight. It will make a straight line which can be used as a guide to make a straight row. The writing on the seed packet will tell you how deep the seeds should be planted. 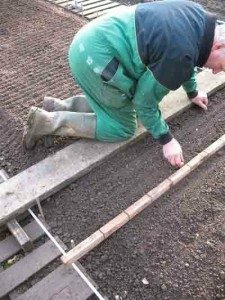 So make a groove along the line which is the correct depth for the seeds. 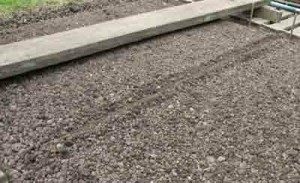 It is a good idea to pile the soil from the groove on one side, so that it is easy to use to cover the seeds once they have been planted. 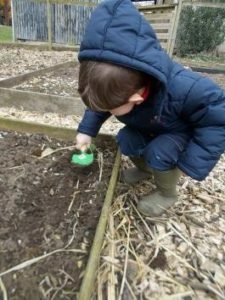 Putting the seeds into the soil is called sowing, Most seeds are tiny and have to be handled carefully, otherwise they spill all over the place. It is quite tricky to sow them evenly and space them out so that they are not all bunched together. Practice sowing seeds by using some sand. Take a pinch of sand between your finger and thumb. Then slowly rub your thumb over your finger, so that one grain of sand drops out. Take a small pinch of seeds between your finger and thumb. Then slowly rub your thumb over your finger, so that one seed drops out, not a bunch. Move along a bit, so that the next seed drops some distance from the first. Take plenty of time, as it is worth the result. 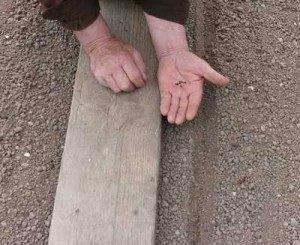 Make a mark in the row, before taking another pinch of seeds from the hand, as you may lose sight of the last seed. Read the seed packet to see how far apart the seeds should be. Use a ruler to help spread the seeds out the correct distance. 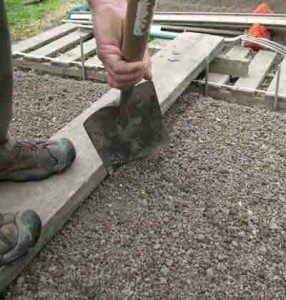 Cover the seeds with soil & fill the groove with soil. 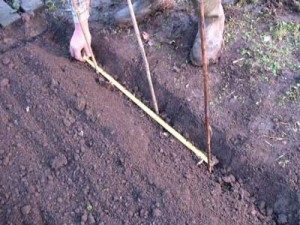 Firm the soil down by gently patting with your hand or use something solid like a wooden block, or the end of a rake. 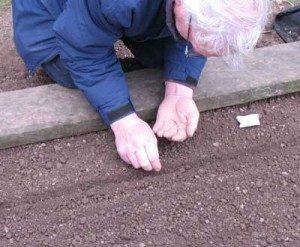 Just firm the soil gently so that the seed is in close contact with the soil. Don’t ram the soil down so it is like concrete. The water must be able to drain through. Don’t make the row into a solid road or river bed which will hold water! Mark both ends of the row with a stick. Then you will know where to look to watch the seeds coming out. Label the row with the name of the vegetable, the variety & the date. 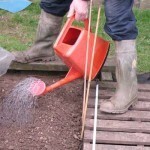 Water the vegetable seeds in so that the seed bed is wet to a depth of 7 cm (3 inches). 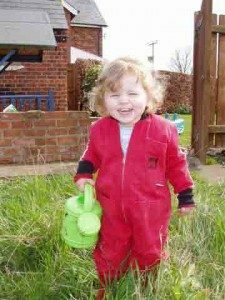 Use a watering can rose at the end of the spout, which will give small droplets of water which will not puddle the soil or wash the seeds out of the row. When the seeds start to grow, they will push green leaves through the soil, and soon your seed row will be a mass of green leaves. The plants must be thinned out so that each plant has room to grow. The seed packet will tell you what space to leave between each plant. 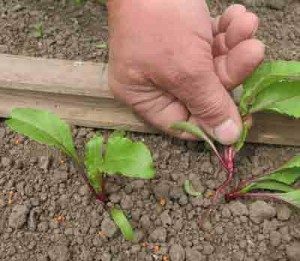 • Water the row of seedlings before thinning. • Allow plenty of time for thinning; this job cannot be rushed. • Place a ruler, tape measure, or (better still!) marker stick with spacings (egg. 10cm) clearly marked, down the row. • Select a weak plant. • Assess the seedlings beside the marks. It is more important to leave the strongest plants than have the exact spacing. So if a weak plant is nearest the mark, select the strongest looking seedling closest to it. • Use a board to kneel on to allow a steady hand. • Do not pull out surplus seedlings in a bunch, because the mass of roots will disturb the roots of the plant being left. • The baby leaves of the discarded seedlings may be eaten in salads, or cooked as a vegetable, depending on the plant. Throw away any unwanted thinnings. Learning how to grow seeds is a lesson for all gardeners.